Sometimes the things we want to talk about aren't really long enough for a post, but you still want to talk about them. And that's where Random Tuesday Thoughts comes in. If you'd like to play along, link up at Stacy Uncorked. Logan's final exam for college allowed him to write notes on an index card for reference. Logan took full advantage. Both sides of the 3x5 note card were used to full capacity. I swear he could write on rice. Testing him, I asked Logan to read part of what was written out loud. Sure enough, he knew what he'd scrunched on one itty bitty card. If there's ever a job for an ultra, teeny-tiny, miniscule Hand Writer, Logan's your guy. Mother's Day was very nice to me. Shelby and her husband bought me a birthstone ring. I have to wear it on my pinkie because I have fat fingers and all standard ring sizes are 7. Logan took me out to eat at a Mexican restaurant, where I indulged in a Taco Salad. Then he gifted me with a volleyball and volleyball net. I'm no Gabrielle Reece but I enjoy a friendly game once in a while. It occurred to me that I have a very large back yard and it might be kinda cool to add sport-ish stuff to play. 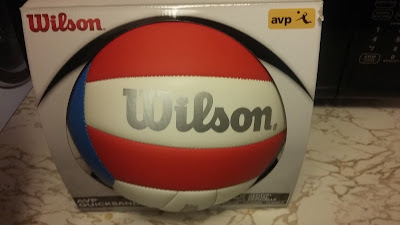 Every time I see a Wilson volleyball, I can't help but think of Cast Away. Anyone else?! Nothing like last minute but I guess I need to make some changes to my blog to comply with the EU GDPR. Here's hoping this dunderhead can figure out the rules and regulations. Also, do blogs HAVE to have https:// in front of their website name now? 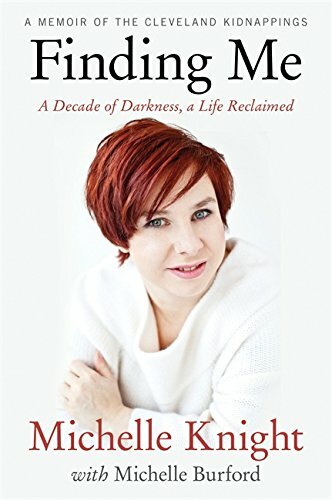 My daughter recently loaned me her copy of Finding Me: A Decade of Darkness, a Life Reclaimed by Michelle Knight. OH MY GOSH! That girl is my hero. She went through hell and back, then again and again during her childhood and the ten years she was held in captivity by Ariel Castro. Her resilience and strength is amazing, considering the torture and abuse she's been through. I'm almost positive I would've been broken, had I been in her situation. I just want to hug Michelle tight...and I'm not even a hugger. The gal who made the memory bear I gifted my nephew for graduation has completed all the other bears. She made four big bears and three small ones out of my mother's blanket. Any backyard games you recommend I purchase? Wanna help me with GDPR?!! Have any graduations going on this year? Your son’s tiny handwriting is astounding. If i were a teacher, i’d probably want to give him an extra point just for being able to do that. That’s a lovely ring, i’m glad your family celebrated you. Volleyball was one of my worst sports in school — i could not get the ball over the net for anything. If i had to pick a sport, it would be race walking, my speed, my team size. Memory bears made of a blanket? That’s a new one on me, i think it’s a fabulous idea. My Sweetie’s mother, when she knew she was dying, cut all of her dresses into quilt squares and made three quilt fronts. After she was gone, her daughter had them finished, and each child has a quilt made of mama’s dresses that they cherish. Oh gosh, GDPR really confuses me but I'm going to do my best this weekend to work on some of the things we're supposed to change. Sigh. What a gorgeous ring! Shelby and her hubby are sweethearts!! Oooh...I'll have to check into the whole https and EU GDPR stuff. GAH! Ohhhh! Those memory bears are so cool!! Especially being made out of your mother's blanket. Its a good thing Logan was young because it looks like it would be hard to read. I have a friend who prints very tiny she can get lot of stuff in her planner. Sounds like you had a great month so far.